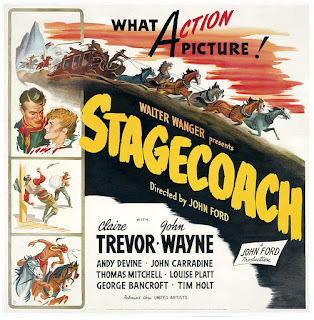 Stagecoach (1939) changed the western film genre forever. Prior to this film, westerns weren’t taken too seriously and were relegated to low-budget second features or serials. John Ford’s classic also began the fruitful association and partnership with star John Wayne. Before Stagecoach, Wayne was starring in low-budget western second features at poverty row studios. The film boasts a wonderful performance from the female lead, Claire Trevor, who should have, like Wayne, emerged as a major movie star. The supporting cast features many who would become part of the John Ford stock company, including Thomas Mitchell (Academy Award Winner), Andy Devine, Tim Holt, and John Carradine. Backstory: Thomas Mitchell had a great 1939. Besides Stagecoach, Mitchell had major supporting roles in Only Angels Have Wings, Mr. Smith Goes to Washington, The Hunchback of Notre Dame, and Gone with the Wind!